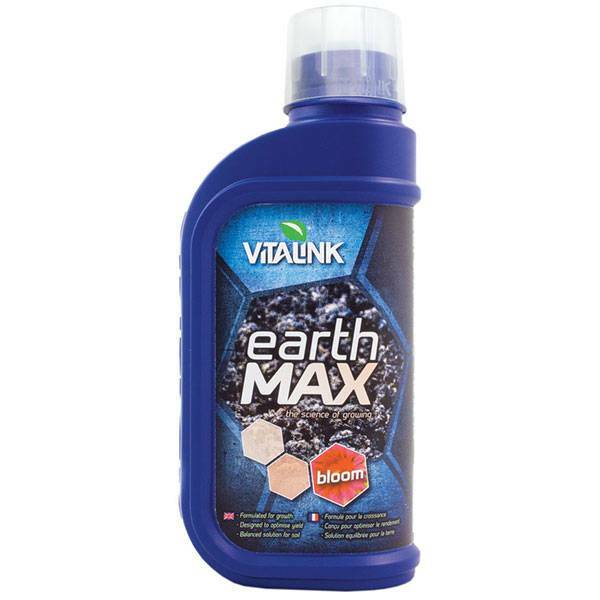 The VitaLink Earth MAX Bloom is a mineral nutrient for plants grown in soil / compost and is portentous during flowering, facilitates a faster flowering and a great yield. VitaLink Earth MAX Grow and Bloom are balanced one-part nutrients which are very easy to use and ideal for growing a variety of plants in a wide range of potting mixes. They improve soil health and its properties by maintaining the balance between nutrient load and biological life. This nutrient contains fulvic acid and chelated micronutrients to improve plants uptake of nutrient solution, resulting in better photosynthesis and vigorous growth and flowering. VitaLink Earth MAX nutrients are ideal for hand-watering, as well as for use in gravity feeding systems and automatic irrigation. The mixed nutrient solution is highly stable. Always check the water quality in your area and ensure you are using the right variant, either hard water or soft water. In very soft water areas we recommend a half strength VitaLink CalMag supplement (0.5 ml/L) during the growth stage. If required adjust the pH. Recommended pH range 5.8-6.5. Shake well before use. Use at 1-2 ml/L for seedlings and young plants. Begin to increase the dose rate once you see your seedlings or plants are established and actively growing. Use at 3-4 ml/L for mature plants. For flowering plants, switch from Earth MAX Grow to Earth MAX Bloom when your plants show signs of flowering initiation. We recommend that you always maintain at least the minimum recommended dose rate for your plants stage of development. The base feed is the foundation of healthy plant growth. Carefully selected additive use can then maximize this potential but it can never replace it. Available in 1 L, 5 L and 10 L bottles.